Donald Takayama's DT-2 in Aqua Blue. Bright 1950's Aqua Blue bottom & rails with a clear deck inlay, gloss and polish finish. Black full body pinlines on deck, black pinlines on nose concave. Black and white lo-profile Takayama oval and Ocean Tern logos. T-band stringer of 3/8"; redwoods outside a basswood core. Big butterfly tail patch, 2+1 setup with FCS Fusion Fins and Takayama center fin all included. 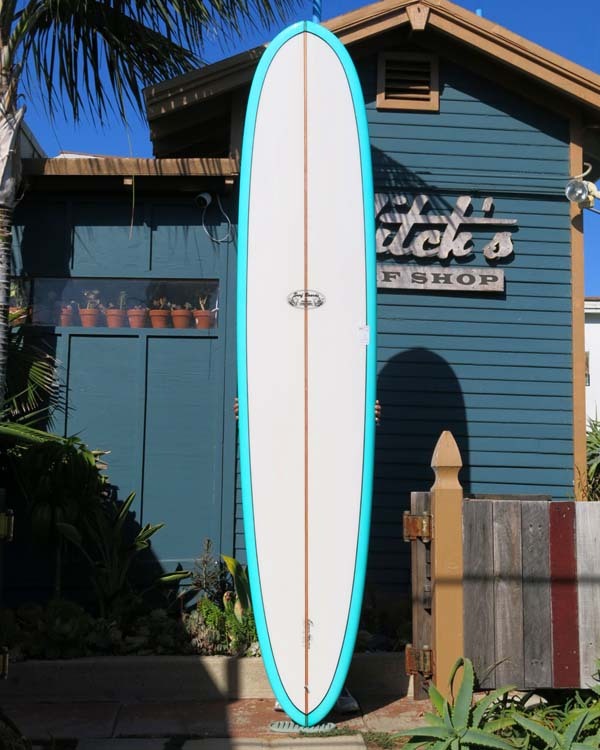 Length: 9' 4" Width: 22 5/8" Thick: 3"
Nose: 18 3/8" Tail: 14 1/2"
Donald Takayama's DT-2 is his most versatile longboard, good for turns, trim, noseriding in any size waves. A great all-around board with wider nose and tail dimensions, subtle concave nose, low rocker, tucked under edge and 60/40 rails.